VMware Workstation and GNS3 are two platforms which are very handy to test and evaluate solutions before live implementation. By default each of those platforms is separate, however both have components which allow integration. What that means is that it is possible to have virtual machines hosted on VMware Workstation to communicate with Cisco equipment which is running oin GNS3. Bridged – virtual network connected seamless way to physical adapter. Virtual machines connected to bridged network will appear in same network as physical adapter connected to computer. Host-only – network available only for virtual machines connected to it. private network for virtual machines. Configuration of virtual networks is flexible and can be adjusted easily. Each of virtual networks can be also presented on host computer as network adapter. 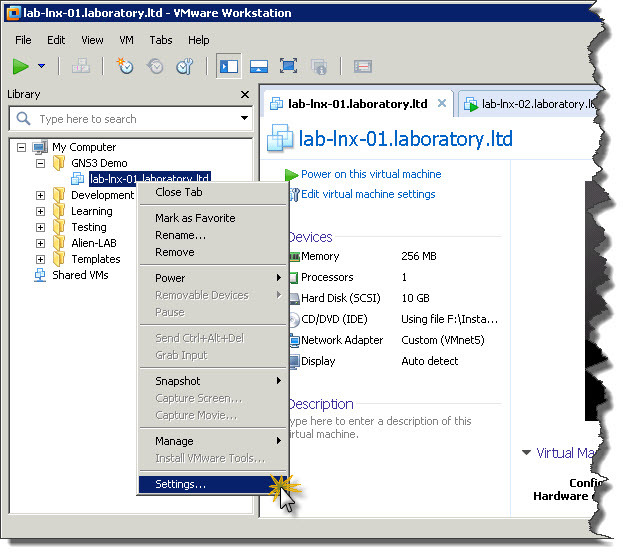 it is possible to integrate both environments together to expand our testing LAB. Once all parameters are set click OK to confirm settings for VMnet1. For demonstration purposes I did use VMnet1, so I will refer to VMnet1 in this article. If you want to configure different VMnet, that’s fine. Just keep in mind that you have to refer to your VMnet in all places where VMnet1 is mentioned. 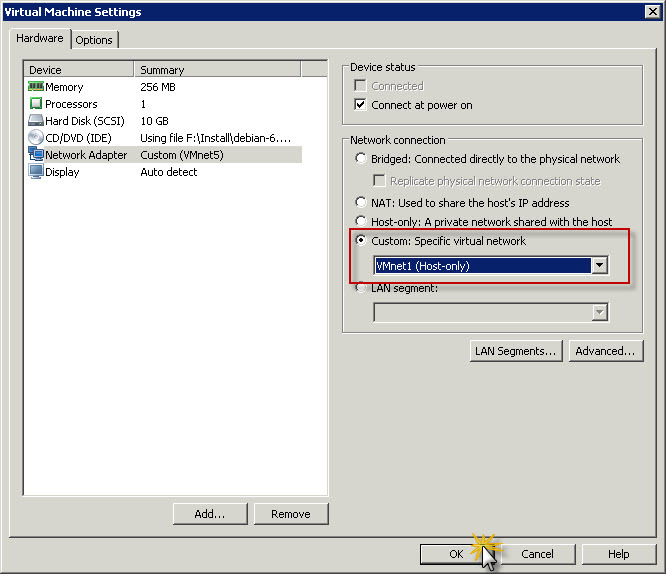 Once VMnet1 configuration is completed new network adapter should appear in Network Connections in Windows. 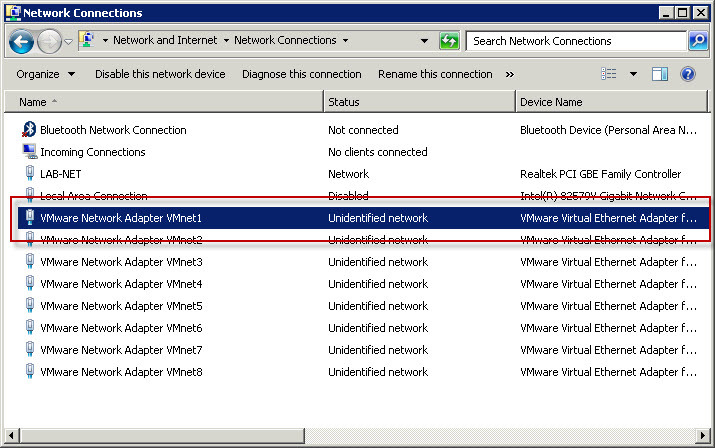 VMware will automatically name that network connection VMware Network Adapter VMnet1. Next step is to assign VMnet1 virtual network to Network Adapter in test machine. As test machine, to demonstrate how communication between VMware workstation and CNG3 will work, I will use Debian 6. So, right-click on machine which you want to communicate with GNS3 environment and then click Settings from context menu. 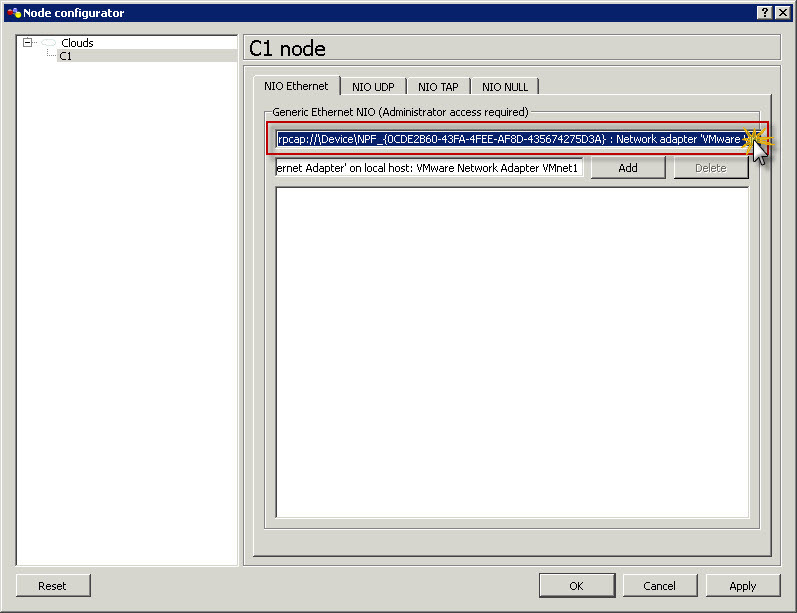 Then on the list of components highlight Network Adapter and in Network connection section click Custom and from drop-down list pickup VMnet1 (Host-only). After that start virtual machine. In my case, once virtual machine was up and running I just logged in as root to check IP address and it has been assigned by VMware DHCP. Now, once VMware Workstation part of configuration is ready we can move on and try to configure GNS3 to talk to VMnet1 and Debian 6 connected to VMnet1 virtual network. First thing is to start GNS3 🙂 and create new project. 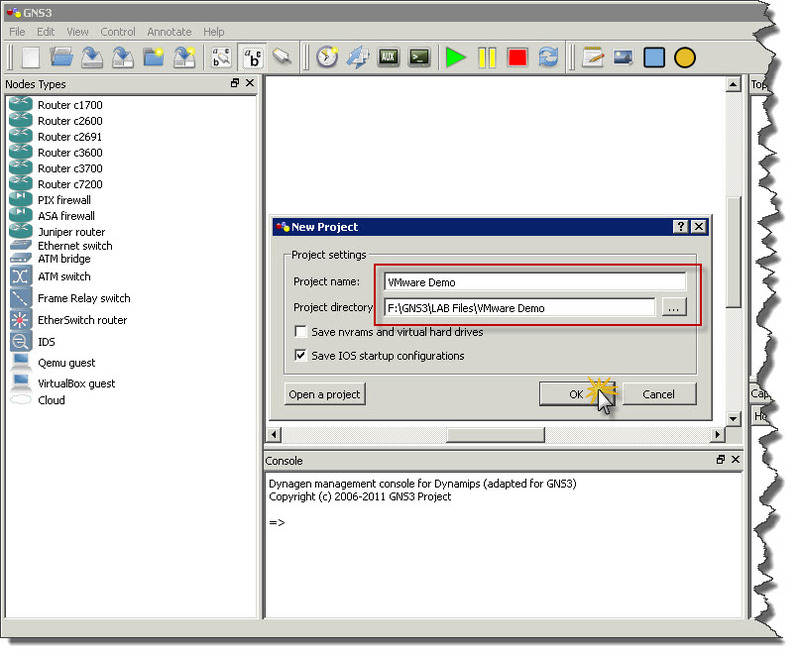 I named project VMware Demo. Then click OK and GNS3 will create new project with blank topology. Now just drag and drop Router object to topology area (assumption is that GNS3 is properly configured with IOS images, so you can add routers to topology and run them). Once router is there drag and drop Cloud object as well and then right-click on Cloud object and chose Configuration from context menu. In Node configuration window for cloud click on C1 node on the list. Then on NIO Ethernet tab click on drop-down list with all adapters and locate VMnet1 adapter and then highlight it. Once VMnet1 is highlighted in drop-down list click Add button to add this adapter to active adapters for Cloud node and then click OK.
After that it’s easy. Click Add link button on toolbar and choose FastEthernet a type of connection we want to make. Then click on Cloud to see list of interfaces you can use for FastEthernet connectivity. There should be only one interface which represents out VMnet1 network. Click on that interface and them move mouse over R1 router and click on it. From list of interfaces on the router click the one you want to connect to Cloud (in my example I’m using FastEthernet0/0 on R1 to connect router with cloud). Screenshots below showing whole process of creating link between cloud and router. Once router is connect with cloud you can start router (green play button) and then right-click on the router and open router’s console. In next section GNS3 Console you can see configuration of the router. Highlited lines on the listing below show where interaction or command is required. There is plenty of system information from boot process of the router to show whole process as much accurate as possible. Cisco 3660 (R527x) processor (revision 1.0) with 124928K/6144K bytes of memory. 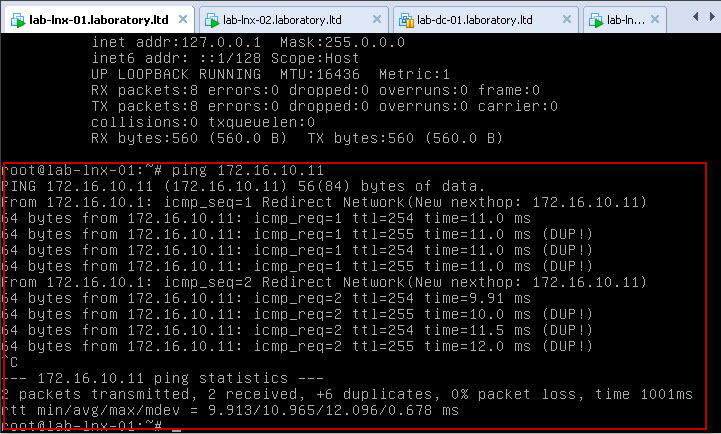 Now we can try to ping router (IP 172.16.10.11) from vitual machine. Once we see success it means that VMware can talk to GNS3 and vice versa. Now VMware Workstation 8 is integrated with GNS3 which gives much more opportunities for testing and evaluating potential solutions. Good post, detailed for anybody new to gns3. you can do this on Windows 7. All screenshots in this article are taken on Windows 7 Ultimate 64-bit machine, so this all works on Windows 7 with no problems. Thanks for the post it was great. How to implement vlan settings in nested virtualization in GNS3. Nested virtualization= when i install ESX in virtual machine and then install vm on/inside these Esx machine and they are using port groups for communication. I guess easiest option would be to create multiple virtual networks and assign each network to different vlan and have multiple virtual networks assigned to machines. For the life of my I can not get this to work.. I can only ping the local VMnet1 interface created on my host computer. 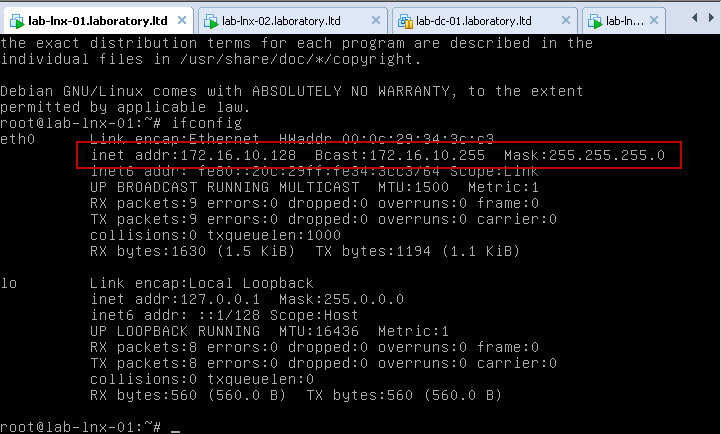 I used 192.168.2.0 as my subnet. I can ping 192.168.2.1 from my router within GNS3 but I can not ping the VMware guest at 192.168.2.128. If anyone can assist I would be very thankful! I have a doubt, if I install GNS3 on the physical machine can i integrate with VM machine? Yes, you can. Post shows how to do that. However, GNS3 and VMware are on the same machine. 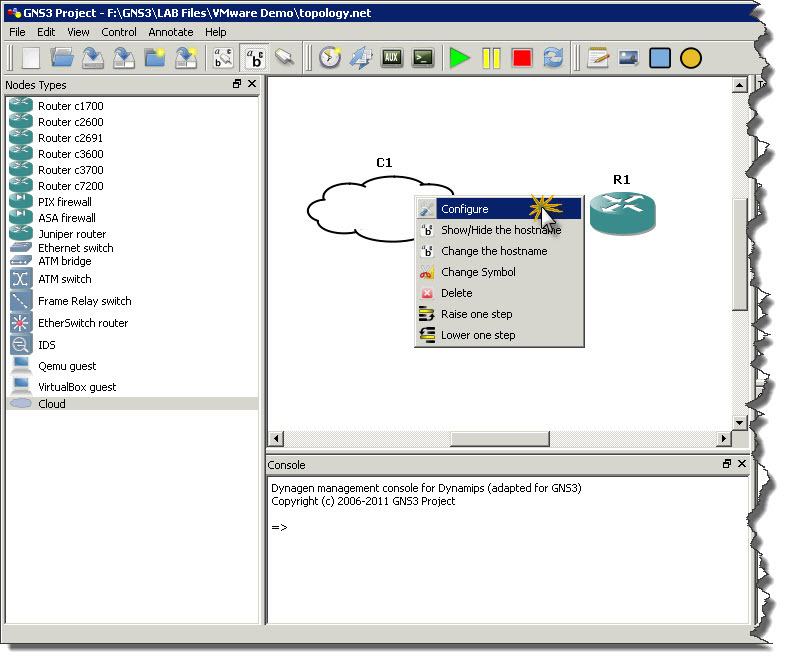 If you have both on separate computers then you can communicate through LAN, but GNS3 will not be able to connect directly to VMnet adapters. This post was really helpful for me today. Please, in this case it is the VMware’s DHCP Server that was used. How do I configure to use the Router’s DHCP Server? Once you configure GNS3 to communicate with VMnet you can just configure DHCP on router and use it. 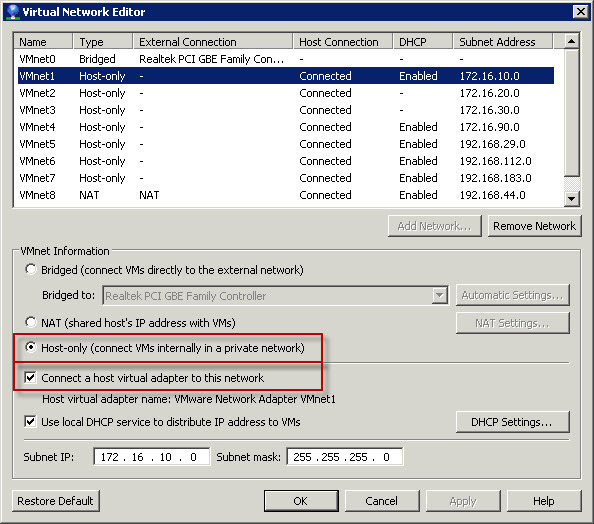 Prior to that you can disable DHCP on VMware Workstation side by changing options of particular VMnet in VIrtual Network Manager. I get all the way to the step below, and my issue is that when I click the drop down list, all of the vmware nics do not show up. I only have the origionals vmware1 and 8. I have confirmed that these exsist with the assigned IP addresses in Windows and by viewing the ifconfig settings in the actual vm. I also attempted reinstalling gns3 because those vmnic’s were created after the origional installation thinking that might be the issue; needless to say it did not help. They still dont show up in the list. Any direction would be appreciated. Node configuration window for cloud click on C1 node on the list. Then on NIO Ethernet tab click on drop-down list with all adapters and locate VMnet1 adapter and then highlight it. Do you run GNS3 on the account with local admin privileges? Sometimes this does block access to network interface information. Restart the NetGroup Packet Filter Driver service. What you mean by making presentation? Can you elaborate a little bit more what exactly you want to achieve? Hi SKufel! I just found this well written guide. I know how to do all of this, but I have another question: I have two VMs in VMware connected to the same VMnet (let’s say VMnet8), because I want them both to be on the same subnet. Is there a way to add them separately into GNS3? Because if I connect a cloud to VMnet8, then technically this cloud has both the VMs in it. Also, I can’t add two clouds and connect both clouds to VMnet8 because that will just be duplicating them. I want to add them into GNS3 separately because I want to connect each VM to a separate port to the switch in GNS3, because I want to configure SPAN (port mirroring). Any ideas? The only way I’ve found to work so far is to add a separate adapter. So one cloud has VMnet8 and another has say VMnet7. This works well, but the issue is that there are only so many VMnets. Does anyone have a way to connect multiple VMs in GNS3 with only one adapter? learning to add the routers in correctly is not simple, and can be a little problematic. i had to remove gns3 completely, reinstall and start over again and thsi time, i have all the router types C types, and virtual box and vm workstation images all working..
titled “How-to : VMware Workstation 8 and GNS3 integration | SK Tech Scratchpad”. Thanks a lot my friend this is really an awesome note. I would like to know how I can connect all vmnet2 to vmnet7 to gns3? 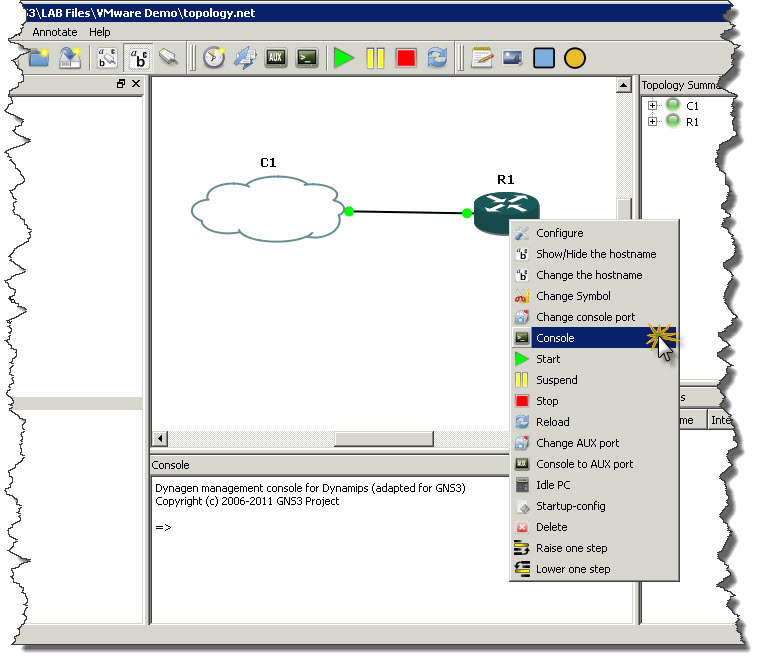 In GNS3 you can add as many network adapters as you have. So, all vmnetX networks can be connected to one cloud object. Then you can connect different ports on router or switch to selected ports on cloud object. I can add three VMnet in GNS3 1.2.1 version. but I need to add at least 5 or 6 VMnet with GNS3. I tried it into two different laptop but in both laptop it can connect max three VMnet with GNS3. I just re-checked to make sure and was able to add 6 VMnet adapters to one cloud object in GNS3 1.2.1. I think that you have to look into VMware / Edit / Virtual Network Editor and define all VMnet adapters there. Once it’s done you should see all VMnet adapters in GNS3. I’d say it’s default VMware installation which creates maximum of 3 VMnet adapters by default. More has to be added manually. I have installed GNS3 and VMWare Work Station 9 and have som eissue with CPU utilization getting hammered. resting at 50% when Routers and switches are Idle. Do you know or have you run into a fix for this? This is common thing with GNS3. What you have to do is to find proper idle value for Cisco IOS images which you are using with your GNS3. 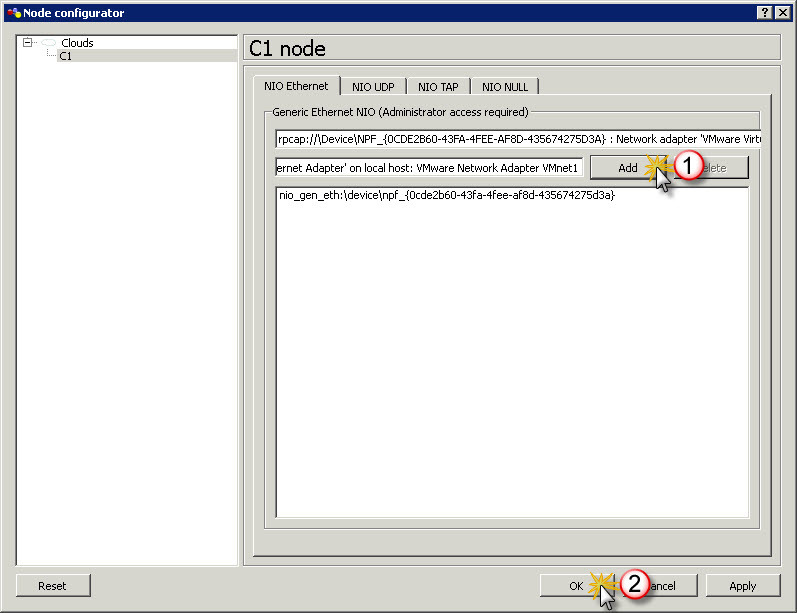 When you right-click on router icon in GNS3 you will see option called Idle-PC. Try to find optimal value using that option. When idle value counted for your system by GNS3 will be optimal then processor utilization will go down nearly to 0% when routers will be idle.